While it is a small book and this is a medium sized verse, the impact it can make on each of our lives is INCREDIBLE, but we have to want it – the impact… That impact, stemming from this verse, is an example of how the Word of God has instruction that is backed up from within the covers of the Old Sacred Book. The title of “Old Sacred Book” is not used in this day and age, as it was centuries ago when they were less plenteous. We don’t “do” good things in order to merit Heaven, we have to place our trust and faith in the Good Shepherd, the Son of God, the Lord of Lords – Jesus Christ, accept His FREE gift of Salvation – which only He could pay for. Then our lives need to show the transforming of our minds daily by reading His Instruction Book for Christians, the Bible. In that manner, He is showing us what it is to be good and the steps about how to accomplish that desire, as we seek to please Him in our lives. The “secret” which is unlocked by reading God’s Word is that He has already shown others throughout the ages exactly how to do what is good, right and acceptable in HIS Sight, not man’s sight. There are thirty (30) passages of Scripture used in this Series that will show all of us some of those things from His Own Word that we can do to not model ourselves after Him, but to actually please Him in each and every one of our actions. An amazing collection of Scriptures were found to help you and I both understand more clearly what it means that we’ve been “shown” in each of them “what is good” and how it related to REAL people. We have a completed text which has an ever ability to help us understand what our Creator God wants us to know as we live each of our lives, day in and day out for Him. This Series has been created from a reminder given in our Easter Services at church on greetings. Many places the Paschal greeting can be found, which is also known as the Easter acclamation – or simply a prompted response to “Christ is Risen!” of “He is Risen Indeed.” Many preachers of time past have used the greeting in order to get the congregation to return the response in unison, as did our Pastor on Easter Sunday. Actually, I like to call it Resurrection Sunday, for that is actually what we are signifying in the celebration to begin with – if Christ had not Risen, we’d have nothing to celebrate – for He’d be like any other “deity” of the making, in a grave. The Resurrection of our Saviour is what makes Salvation possible and our Eternity secure, as our Faith is in Him alone. Our church’s outreach this year for Resurrection Sunday this year was the message that “Hope Is Here”, which focused on the Risen Saviour and how those without Him could trust Him. The two sentence response, “The Lord Is Risen!” being said by our Pastor and “He Is Risen Indeed” said by the congregation is what started this Series. It spurred much looking and finding, as well as, singing and praising the God of Creation as pieces fell into place like the last few puzzle pieces when completing a complicated puzzle. 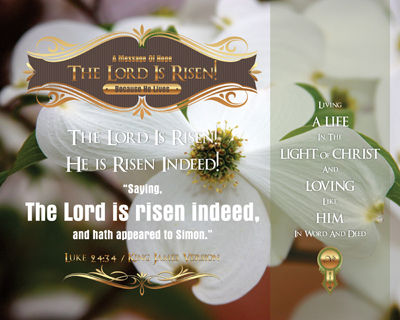 A few hymns came to mind also, including: He Lives, Because He Lives, Christ Arose and Crown Him with Many Crowns. We sang two of them on Resurrection Sunday morning in service – may they be upon our minds, hears and lips as we live out our daily lives. They are wonderful reminders of what our Risen Saviour has done for us! There are ten (10) reminders drawn from my Bible study on how we each can show how we know that Christ is Risen and is Alive! Each of these reminders is a specific verse of Scripture that not only reminds, but shows each of us individually what we should be doing to live out that personal Risen belief in our own lives. Can we, or more important maybe, will we respond “He is Risen Indeed!” with every fiber of our being? Choose today to serve the Risen One and share the Message of Hope that so many around us so desperately need in their own lives. © 1959, Renewed 1987 by Manna Music, Inc.
Another of those times is when I accepted Christ as my own personal Saviour – which has made Him more than WONDERFUL to me. Before then, the mere mention of His name was one to be revered and respected, but not because of love. Without any doubt one bit, after accepting Him, all kinds of Wonderful filled me. Before, singing was a chore, after, it became a passion. Pre-acceptance there was no desire to read His Word, post-acceptance brought a thirst for His Word – to discover a Well of Knowledge deeper than could be dove into but yet shallow enough to begin. 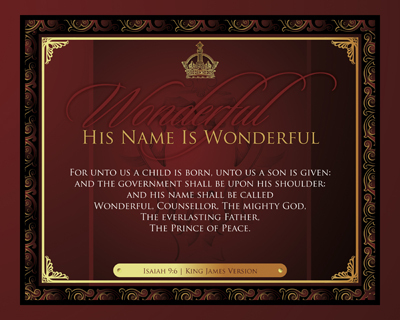 Oh, for us to realize, that in the Old Testament time they did not understand just how Wonderful Jesus Our Lord would be, for He had yet to come as the child. We have the benefit of having a completed, preserved Bible to guide us along in our Christian lives, knowing what Son of God has done for each of us. The Bible tells us of His Great Love for each of us – all for the reading, hearing and living in our lives. There are ten (10) Wonderful names (including Wonderful) that are presented in this Series, may we be intimately familiar with each of them daily. Indeed we can sing of how Wonderful He is to us and have the opportunity to have the Relationship of a Lifetime with Him. God the Father gives us both Life and the Time to spend with His Dear Son, so that we might Know Him and Live Eternally with Him. 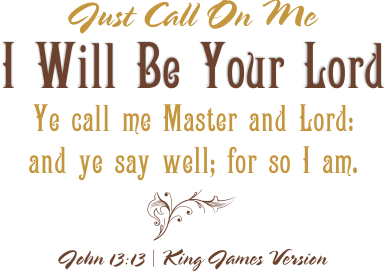 Will someone today hear you living out the Wonderful Name of Jesus? Will others see each of us sowing to the Harvest because of how Wonderful He is to us? Will another person today meet, pass by, or interact with you today that needs to HEAR for the FIRST time, His Name Is Wonderful?! May each of us be faithful to walk the walk of life, in light of Eternity, singing, talking, praising, praying, living out What He is to each of us! One of the most fascinating things for me about the Bible is the ability to pick up on the “thread” that runs from the front to the back of the Bible when looking for common themes and building on a concept, action being carried out or reminders placed of events which impact the one being sought after at the moment. It is almost like a breadcrumb trail in a literary work, one can follow a story line and character plot by identifying them and remembering where they were, as well as quickly accessing them for future information needs. In the case of this Series, the trail shows something different than that of what was personally expected to be found. The Scarlet Thread is something that can be lived by, a plan so to speak, that is VERY short but also EXTREMELY pointed. The question could be asked in this manner of each of us: Would we “reason” together with the God of All Creation, using His Word as the basis for everything we think, consider, do and/or put our mind to doing? He offers us a clean slate by providing Salvation. We can live in this modern world, but be separated from it with identification that others can easily tell who our Master is, with that same Creator God providing for our every need, including protecting us from Satan himself. Will we choose to live in such a manner that everyone in our home has a genuine desire to accept the Lord Jesus Christ as their own Saviour and then live for Him because of how we show our love and affection towards them? Indeed we can be clothed with righteousness and right living without looking backwoods. And, finally, will each of realize that we have a place of Service to our LORD and King, to which we should always make sure we are presenting ourselves in a manner that will please Him, honor Him and show appreciation for Him. There is a right way and a wrong way to do just about everything we can set our minds to doing, we need to focus on getting those right ways to the forefront of things we bring ourselves to be doing. It may only be a thread, but God can see it, others can see it, our families can see it, everyone can see what we are doing and make up their minds if we are men (men, women, boys and girls) seeking eye-pleasing, or to please our Creator for being so Gracious and Kind! The following list of four items is what this full sized, little created set utilizes as words to describe what Jesus Blood was doing for us WELL before Him coming to the Cross. Some of the most profound things in life are indeed very simple, they just have to be committed unto our Great God, controlled by His Hands and completed on His Timetable. We can find the thread as it is weaved through the Bible easily if we spend even a small fraction of time in His Word. Even unsaved people can see the “difference” in how we are doing with our relationship with our Saviour – and they DO NOT know Him like we do. As this Easter season is approaching, more time has been spent looking into what could be shared with people from the Bible about WHY Easter is more than just showing up to church at the one of two occasions that some folks do. What it all boils down to is something so profound that we as Christians cannot even comprehend the how, but we sure do KNOW the what! If there had not been the Resurrection, we would have NO reason to have Faith. Redemption is because of the Resurrection. 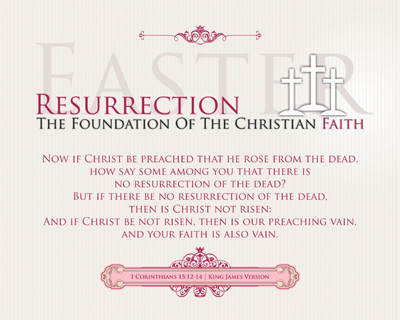 The very Foundation of our Faith rests on what we celebrate on Easter – The Risen Saviour! 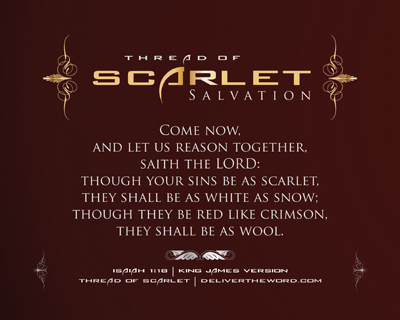 The One of Scarlet that is being referred to is the Son of God, Jesus Christ, our Redeemer. The Messiah came, born as a babe, so that He might be our payment for Sin and settle the debt of the final Sacrifice by dying on the Cross – and being Raised AGAIN! Do NOT forget that last part – it is CRITICAL! Has it been a long time since you’ve heard words spoken like those? Would we say that “folks don’t talk like that anymore?” or that it has been a long time since we’ve seen people get stirred up over just WHO paid that Price with His LIFE? Finding the reason for, hinge or core for any belief or practice is key to understanding the importance of that item for any group of people. Simply put, it is what makes that item real and believable to that group of people. Some of those things are more tangible than others, with some even being so obscure that it causes other to be skeptics even after presenting all the information about it possible. On the other hand though, comes what might be referred to as a “tradition” or could be summed up in the this manner, “We’ve always done it this way, so why change now?” The challenge to those thoughts is this though – they don’t make a change of Destiny or Eternity, Resurrection DOES! Our Faith is built upon Christ BEING Risen! That FACT changes everything – and this Series shows us 30 ways of telling folks what that means this Easter. This is our Scarlet Line for our time – we have to TELL others what it means, what it will mean for them – whether they choose to accept Him or reject Him. Telling someone their dress is “pretty” or that their suit makes them “handsome” is all and well, but it only lasts for a moment, each soul lasts for Eternity. Each of us have thirty plus one ways to tell them what Easter means for the Christian – thirty (30) from this Series that gives them pure Bible AND our own personal testimony of what that Redeeming, Resurrection has done for us! 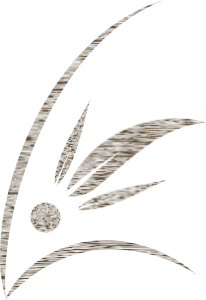 The following list of thirty (30) Faith items provide solid reasons of the Who, What, Where, When and How in the Bible that we are to Celebrate this Easter. These thirty (30) items provide a solid Foundation for each of us to understand that Easter is more than brightly colored clothes and egg hunts for the children, it is the Celebration of the Resurrection. It is indeed and should be a joyous occasion for each one of us – sharing with those closest to us and those at any distance – as Christians to Honor the Saviour and to Praise our God of All Creation. The sets have no real dividing reason or method, except to make them a little more manageable – each of them contain ten (10) Faith items from Scripture to remind us of why Resurrection Day makes Eternity in Heaven possible for the Believer. If there is a verse of Scripture that has had the largest impact on my life, John 12:32 has to be it, of course it is one RIGHT next to John 3:16 | KJV! This particular verse is EXTREMELY special to me, for it is what God the Father used to spin me around, pull open all my protective doors/walls and empty me of all the glass shards, so to speak, that I’d been holding inside which had caused me so much pain for so many years. It had gotten to the point where everything that was happening around me was a fight for survival and there we no other places to turn. The date was March 20, 2008 and the place was Pastor’s School, with seven of our Pastoral Staff at church, away from all that was familiar to me sans them. Oh the times we take to focus on various things, not realizing that they could be leading us to miss those things which are God’s Will for each of us to do. Notice in the verse that sets the launching place for this Series, that Jesus uses the word “if” to describe our condition. When we lift up ourselves, we are obstructing the view of those who we are being a witness to, whether that be directly or indirectly. We are to show forth our Lord and Saviour Jesus Christ, share our testimony of what He’s done for us and share the Word of God – nowhere does the Bible say we draw them – Jesus does that. It doesn’t matter their nationality, skin color, language, social status or condition – ALL men (men, women, boys, girls) will be drawn unto Him. Just yesterday while a co-worker and I were out to eat at a local restaurant, just behind us at a table were two ladies and two gentlemen who surprised us about half-way through our meal. Our waitress, whom we know fairly well, was picking on me about coming in without a minister friend and inquired as to whether or not I was going to behave myself. Anyone that knows me knows my answer was quick and said with a cloud of laughter – OF COURSE NOT! I’ve never met this lady or any of her table mates before in my life – but she had me pegged from me asking Grace before eating and the continued conversation made in that time. It made me ever so much more aware and inclined to consider my speech, tone and carrying on, not only in a public place, but the most private place of my heart. Will each of us be keenly aware of the factor that God the Father knows our very thoughts and intents of the heart? Others can and will form opinions, along with a long line of responses they will hold onto for a long time based on what you and I say or don’t say in front of them. 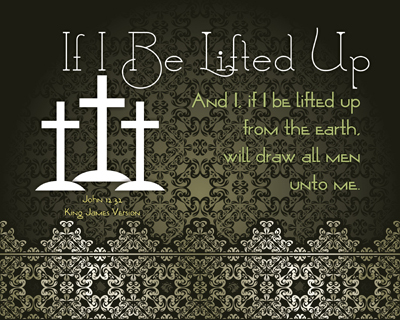 There are fourteen (14) items to consider in the what, when, where, who and how of our Lifting HIM Up – for not we ourselves are worthy, only ONE is and His Name is Jesus. The word association with the verses can help each of us to remember them and why they are important in Lifting HIM Up. 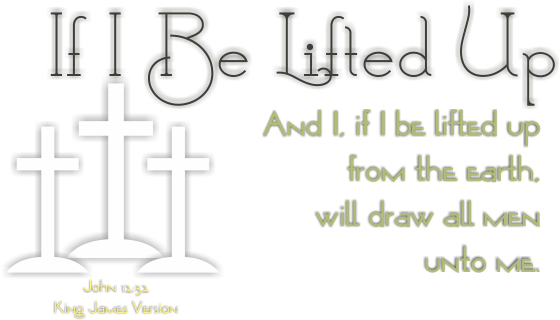 Each set is comprised of different approaches, each taken from the Bible, based on the word “lifted” and presented to us for daily consideration. What are others saying about your conversation today? Will they know whether or not we are Christians by what pours from our tongues and is found evident in our lives? It is the desire of my heart for that very thing to be TRUE! 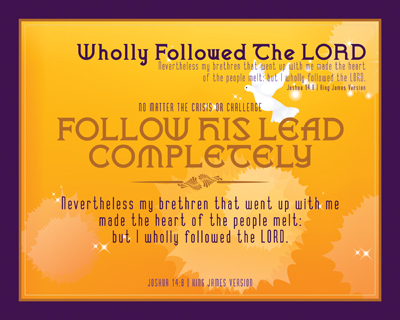 Nevertheless my brethren that went up with me made the heart of the people melt: but I wholly followed the LORD. 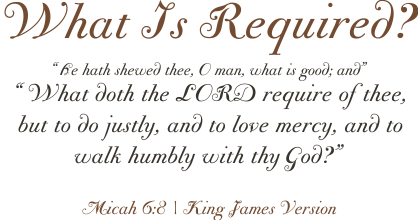 One of the noted items of mine became to be “Wholly Holy” as the Lord wanted each of us to be, by His Righteousness, Mercy and Forgiveness, made possible by His Redeeming Blood. That has remained one of my top prayer requests made in the Throne Room of Heaven, because I want to be one who Wholly Follows the Lord! As that first verse (Joshua 14:8 | KJV) is the foundation verse of Scripture for this Series, it is appropriate to point out that it also has a help in it that is found by studying the surrounding passage thoroughly. Didn’t really notice that the phrases were interchangeable when first pulling them together, but they are supportive of each other in either order. All Scripture really does this for us, we just have to be willing to find the ribbon and follow it. There are eight (8) verses used for this Series, which create eight (8) point and consideration phrases for us to take into, being pulled from both the Old Testament and New Testament. Each of them speak of being “wholly” and “follow…” in several variations. These discoveries are simply amazing and astounding finds which can make a major impact on our lives as we choose to apply them in such a manner. May we stay committed to accomplishing what God the Father has for each of us to do and remember the life lessons that the Bible teaches us to consider all along the way! What a topic to discuss, that actually came from a considerably different point of view! Forgiveness – something each of us do, have done and need to continue. It is totally different than a person saying “I’m sorry for…” This Series on Forgiveness was actually developed from verses utilized in presenting four (4) things that God does with our confessed sin used by Amazing Grace Missions at Fairs around the United States and other countries. Most of the time when a Series is being developed and worked on, it results in review of many passages of Scripture to make sure that the item selected fits and is taken in the right context, or as some my think, the write context. By that, it is meant to indicate that the research done for them is much greater than the work on the Series themselves, which often provides material for a new Series to be developed. This one followed that same pattern for certain and served as a dual purpose, first to solidify the understanding of what God the Father does with our sins and second to see if a pattern exists for the set of Scripture verses indicate something different/larger than the phrases themselves. Be found “having compassion” as God has for us. 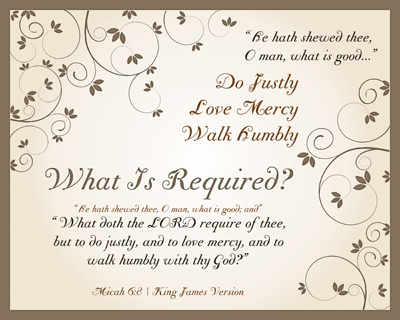 Understand “great is His Mercy” toward us, which we should show forth to others. Remember “my soul delivered” allows us the opportunity to witness to others through personal testimony. Live our lives as God’s Word commands so others will have desire of have His Word written “in their hearts”. We are the ones who have to commit those actions: Be found, Understand, Remember and Live, so that we have a proper view of Forgiveness ourselves! This Series on Forgiveness have four sets of prints actually, but all follow a consistent set of design features. The original items were four (4) statements following the statement “What four things God does with our confessed sin”, two Christian songs and nine (9) verses of Scripture from Psalm 40 | KJV. Each of the truths presented in this Series are from God’s Word. The two pieces of music (which only the words are used in the prints) were based on Bible Verses. All of the focus is placed on Forgiveness, both our receiving of it as Christians from a Holy God and ourselves with others such that our communication not be hindered from reaching Heaven’s Throne Room. Are there things in your life and mine where we don’t sit well with the word Forgiveness? If so, this Series points us to specific places in the Bible to gain traction on the matter of how God The Father forgives us and how we are to be in forgiving others. 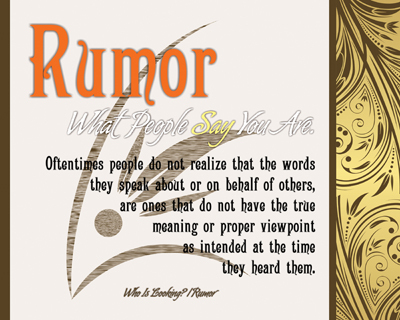 Rumor – is what people say you are. Reputation – is who people think you are. Character – is who you really are when no one is around. As my notes were collected, a friend happened to post a few of her personal responses on-line concerning a “paper” she was reading about the very topic with a few notes. As a little more research revealed, it became evident that the she was reading and responding to excerpts from a book published by a well know conflict-resolution consulting firm that is familiar to me due to the large part of my career being heavily involved in human dynamics. With just a tad more digging, it was discovered that my personal library has an earlier edition of the very book being read – how could this be reoriented to looking in the Word of God was the mission. Simply – it was not difficult at all and what was discovered even surprised me – the Bible helps us with all three areas/words! It took some digging over two days to get into the meat of it, but just as plain as day, this “little” Series has become one, that although small in stature, is mighty on delivery. Each of them were streamlined into a statement and two verses were found to correlate them to how we relate to them in today’s real world. The first word in the Series is “rumor”. The KJV spelling of the word is “rumour”, meaning “a current story passing from one person to another without any known authority for the truth of it”. There is SO much more to conveying information from one person to the next that has nothing to to per se with verbal communication – the sounds and inflections made in speech when the words are spoken. That most likely is our “definition” of rumor for most folks – something being told, where no one really knows of the accuracy or authenticity of the message being delivered. Surprisingly, each word – rumor, reputation & character – is found in God’s Word, each with an amazing application – of GOOD. In each instance, a word that can be seen as a negative or clouded manner, also proved to be from the Bible Scriptures to be shown to be powerful, used by God the Father to convince His children to obey and see the Miracles of the Lord Jesus Christ, the Saviour of the World. While the world has fed all of us at some level a load of unrest, daunting situations to deal with and increasingly corrosive manners in which to tear others down, we can find TRUTH in each of these three words which is a blessing to know and a game changer on the world’s idea of turning over good people to bad things. Each of these three words builds upon finding specific items in God’s Word to build a set of prints to Encourage all who will read them. 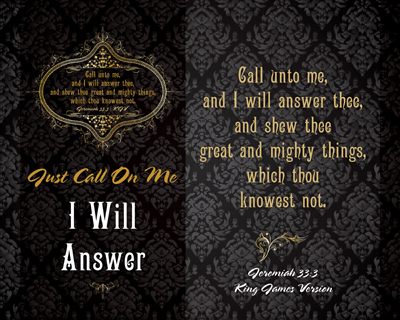 By having these words revealed to us, we each can see what the God of All Creation had in mind (that word is used on purpose) for us in covering His being with us, our being servants and seeking His Will for our lives. As we do each of those things, we not only draw closer to our Lord, but we reflect Him and build a foundation relationship that is evident to everyone. These areas build relationships with others also, not only as we think about things, but as we are doing them as unto Him – representation at its highest form. What are people saying about your and my walk with the Lord? Who do others think we are serving in our ministering? Is it obviously evident that we have a daily walk with our Saviour? These are the things we should desire to be abundantly clear – trust me, from personal experience, even the most worldly can tell the difference and they ARE looking.